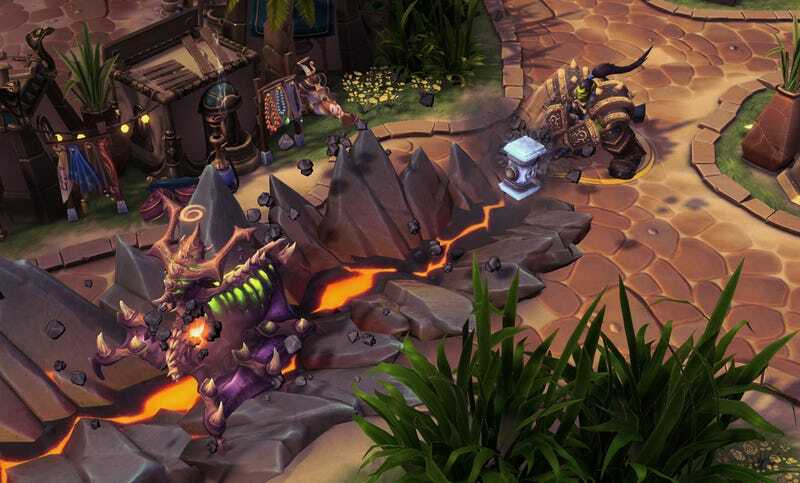 Heroes of the Storm has been running very well for the most part since I started playing it earlier this year. It’s suddenly gotten a lot worse over the past few days, though. The “S2MASTER_UNKOWN_MMQ_HANDLE” made it so that whenever I tried to ready up a character like the giant pink ladybug you can see above (real name Anub’arak), he’d forcibly return to his idle state all of a sudden. I had a few bouts of this issue that seemed to be resolved, if only temporarily, by restarting the game. But a quick scan of the HOTS community confirmed that many other players were dealing with similar issues, and some haven’t been able to play at all over the past few days. Threads on the game’s subreddit and official forum pages identify the same problem with readying up, with nobody able to find a clear solution or workaround yet. Some players (including several friends that I play with regularly) have been able to temporarily avoid the issue by restarting their clients, but it still ends up flaring up for them again afterwards. Blizzard has some kind of bug in Heroes of the Storm that causes high latency randomly even while internet speed is above 60mb/s. However, this does not only effect my Heroes of the storm, as soon as Hots causes it, I start to randomly disconnect in other games. It requires a computer restart but it fixes the latency for Hots until the bug decides to appear again. No other solution had worked for me, but I keep this saved because it has been working. For any of you having Latency problems please tell me if my solution works for you. Flushing DNS will not work. I’ve tried it a million times. I, for one, am just gonna keep playing League of Legends and Dota 2 until the dust settles for Heroes once again. UPDATE (3:52 pm): A Blizzard representative told Kotaku in an email that the unable-to-ready-up problem “resulted from an internal issue with one of our services and has now been fixed.” Let me know if you continue to have problems with this or anything else connectivity-related in Heroes of the Storm—my contact information is below. To contact the author of this post, write to yannick.lejacq@kotaku.com or find him on Twitter a @YannickLeJacq.